The National Audit Office says the number of young people reoffending following a more serious community sentence has gone up since 2000. The watchdog said that, overall, serious young offenders were as likely to reoffend as they were 10 years ago. 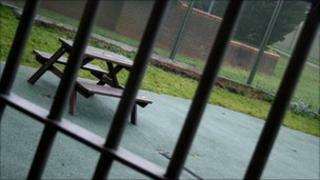 Ministers want to introduce more and tougher community sentences as part of an overhaul of criminal justice. Youth crime is falling, but the NAO says it still cost the UK economy up to £11bn in 2009. The NAO said that young offenders committed more than 200,000 offences in the year to April 2010 and they were responsible for almost a fifth of all crimes. The number of first-time offenders dropped to 61,422, the lowest figure in the 10 years since the youth justice system was reformed. There has also been a 25% fall in the volume of reoffending over the decade. But the figures show that reoffending by young people given more serious community sentences has risen by 6% since 2000, while reoffending among those leaving custody has dropped by only 2%. The most challenging offenders were proving difficult to reform, said the NAO, and three quarters of youth offending managers agreed that it was difficult to find evidence of what worked. "With resources likely to reduce, the youth justice system is therefore in a weak position to know which activities to cut and which to keep to ensure that outcomes do not deteriorate," it said. While 60% of offending is dealt with in court, only about 3% of these crimes lead to a custodial sentence. But those sentences consume about 40% of all youth justice spending. The Ministry of Justice's proposed reforms to cut costs include scrapping the Youth Justice Board and bringing its functions in-house. It also wants to make community sentences tougher so they play a more important role in punishment and rehabilitation. Community sentences are cheaper than prison - but the NAO said that the youth justice system could cut its custody costs by 11% just by reducing the number of places in secure units that it was not using. Each youth custody place costs at least £50,000 a year. The NAO said that recent reforms to youth justice should mean that more resources would be directed at offenders most likely to break the law again. Margaret Hodge, who chairs the House of Commons Committee of Public Accounts, said: "This report shows that the Youth Justice Board has been an effective leader of the youth justice system in recent years, and that this has contributed to falls in youth crime. "It is regrettable to see that practitioners have so little robust evidence about which of their many activities are most effective. "This is the more worrying because, with cuts in prospect, they will soon face difficult choices about what to stop doing. "The Youth Justice Board itself is partly responsible for the knowledge gap, having spent less than 0.5% of its overall budget on research in recent years." A Ministry of Justice spokeswoman said: "We welcome the NAO's report, which we will consider carefully and take appropriate action to address. "The Government is committed to tackling youth crime; reducing reoffending; and providing a more effective service for the public - we are consulting on proposals for youth justice reform in our Green Paper on sentencing and rehabilitation."